This is one of those stories that started out being about one thing and wound up being about something else. 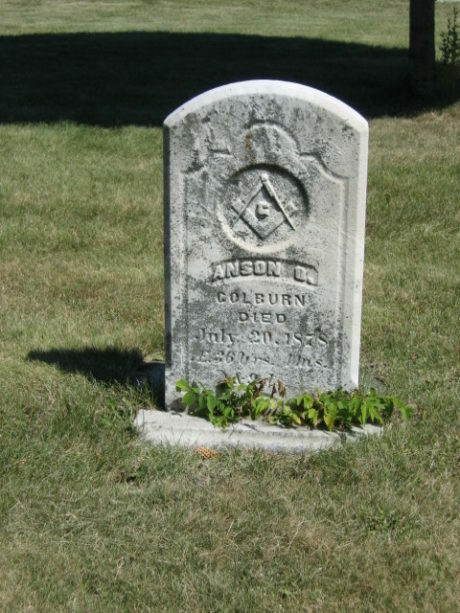 The original idea was to write a story about the symbols on the headstone of Anson O. Colburn who died on July 20, 1878, from pneumonia. It turned out to be harder than it should have been to find out anything about him because regardless of what name is carved on his headstone, he appears to have gone by his middle name, Otis. It turns out that Anson/Otis is related to two other Colburns who are buried in the cemetery. Chester (C. J.) Colburn was Anson’s younger brother and Carrie Colburn was Chester’s second wife. Chester’s story turned out to be rather more dramatic than Anson’s. While Anson seems to have been a successful miller, Chester’s occupation in the 1869 City Directory was listed as “human hair.” A few years later he was described as a “hair worker,” presumably someone who fashioned wigs and switches for his customers. It was an occupation that he pursued for 25 years. In 1894 Chester Colburn’s entry in the directory changed, and he was listed as a “physician” with an office in the Minneapolis Bank Building. He was not a physician in the sense that we use the word today but would best be described as an alternative healer. He practiced magnetic healing whose adherents believed that magnets had the power to relieve pain as well as treat a variety of medical conditions. The theory was that the magnets would attract the iron in blood cells and improve or redirect blood flow. The magnets were sometimes worn as jewelry or on straps that people wore around their wrists, legs, waists or backs. It was a popular practice that was thousands of years old but one that was rejected by more traditional physicians. On February 18, 1898, Colburn was arrested and charged with indecent assault and seduction. His accuser was a young woman whose name was not revealed in the first or any other accounts of his arrest and subsequent trial. Colburn insisted that he was innocent and said that he would be able to prove it. Newspaper coverage about this “somewhat notorious case” was sketchy to say the least. It was not unusual for the papers to print the names of victims, including minors, in their stories; papers did not back away from reporting grisly or sensational details because crime stories, the more shocking the better, helped sell papers. It’s not clear why the press paid so little attention to this story. It may be that it turned out not to be very interesting after all, but the jury saw or heard something that persuaded them of his guilt. We have no way of knowing what that was. Chester Colburn’s widow, Carrie, lived for another 19 years. She died from tuberculosis on January 6, 1917, and was buried next to her husband. Their graves are unmarked. The story of Anson’s marker will have to wait for another issue. You could go to the court house, and look thru the Criminal Case index, and once you get the case file number, you could request a copy of the case file, it might contain some interesting stuff.